Chesbro was elected to the National Baseball Hall of Fame in 1946 by the Veterans Committee, though he had received little consideration from the Baseball Writers' Association of America (BBWAA). Some baseball historians consider the 1946 election a mistake, and believe that Chesbro was elected solely on the basis of his 1904 season. He was born John D. Chesbro on June 5, 1874 in Houghtonville, a village in North Adams, Massachusetts. He was the fourth of five children of Chad Brown Chesebrough, a shoemaker, and Martha Jane Fralensburgh. In 1892, Chesbro began playing for a sandlot ball team in Houghtonville. He worked in 1894 as an attendant at the Middletown State Homeopathic Hospital in Middletown, New York in order to play for the Asylums, the team representing the mental hospital. There, an inmate gave Chesbro the nickname "Happy Jack", due to his pleasant demeanor. Chesbro was sold by Richmond to the Pittsburgh Pirates on July 7, 1899 for $1,500 ($42,738 in current dollar terms). He made his Major League Baseball (MLB) debut with the Pirates on July 12, 1899. He recorded a 6–9 win–loss record for the 1899 Pirates. After the season, on December 8, 1899, Chesbro was traded with George Fox, Art Madison, John O'Brien, and $25,000 ($712,300 in current dollar terms) to the Louisville Colonels for Honus Wagner, Fred Clarke, Bert Cunningham, Mike Kelley, Tacks Latimer, Tommy Leach, Tom Messitt, Deacon Phillippe, Claude Ritchey, Rube Waddell, Jack Wadsworth, and Chief Zimmer. The Louisville club dissolved that offseason, and Chesbro, Fox, Madison and O'Brien were assigned to Pittsburgh in March as the National League (NL) reduced from 12 to eight teams. At the end of the 1902 season, the upstart American League (AL) began to entice NL stars to join their league by offering competitive salaries. Chesbro agreed to sign with a new AL franchise, the New York Highlanders (presently known as the New York Yankees), for the 1903 season, for a $1,000 bonus ($27,396 in current dollar terms) to join the AL. The news broke when Jesse Tannehill, who also agreed to join the Highlanders, told Pirates owner Barney Dreyfuss about the planned defection while under the influence of pain medication. 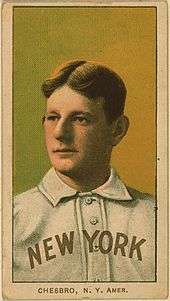 When he refused to participate in a postseason series, Dreyfuss released Chesbro from the Pirates. Chesbro was inducted into the National Baseball Hall of Fame in 1946 balloting by the Veterans Committee, which considers individuals who are eligible for the Hall of Fame, but no longer eligible to be elected by the Baseball Writers' Association of America (BBWAA). That year, the Veterans Committee elected eleven players: Chesbro, Jesse Burkett, Frank Chance, Johnny Evers, Clark Griffith, Tommy McCarthy, Joe McGinnity, Eddie Plank, Joe Tinker, Rube Waddell, and Ed Walsh. During years where Chesbro was eligible on the BBWAA ballot, Chesbro received zero votes in the 1936 balloting, one vote in the 1937 balloting, two votes in the 1938 balloting, and six votes in the 1939 balloting, zero votes in the 1942 balloting, and zero votes in the 1945 balloting. Chesbro's 1904 record for games won in a season (41 wins) has stood for over a century—one of the oldest major records in baseball, or in any other sport. Under current playing practices, his record is unbreakable. Chesbro started 51 games that season (plus 4 relief appearances) and pitched 48 complete games, for a record of 41–12. Today, it is uncommon for a pitcher to start even 35 games in a season and complete games are a rarity. The only other 40-win season since 1900 was 40 by Ed Walsh in 1908, and only three other pitchers in the modern era have won as many as 35--Christy Mathewson (37 in 1908), Walter Johnson (36 in 1913) and Joe McGinnity (35 in 1904). Since the pitcher's mound was lowered to its current height of 10 inches in 1969, no pitcher has won more than 27 games in a season. Fleitz, David L. (2004). Ghosts in the gallery at Cooperstown: Sixteen little-known members of the Hall of Fame. McFarland. ISBN 0-7864-1749-8. Retrieved November 25, 2011. ↑ "MLB Statistics, Pitching, All-Time By Year, AL, W". Major League Baseball (MLB), mlb.com. Retrieved January 3, 2013. ↑ "MLB Statistics, Pitching, All-Time By Year, MLB, W". Major League Baseball (MLB), mlb.com. Retrieved January 3, 2013. ↑ "Baseball Reference, Leaders, Pitching Leaderboards, Wins, Single-Season". Sports Reference LLC, Baseball-Reference, www.baseball-reference.com. Retrieved January 3, 2013. 1 2 3 Campbell, Bruce (July 30, 2007). "Slugger Bonds' record-to-be will be broken in time". Enid News & Eagle. Retrieved December 14, 2011. ↑ "MLB Statistics, Pitching, All-Time By Year, AL, GS". Major League Baseball (MLB), mlb.com. Retrieved January 3, 2013. ↑ "MLB Statistics, Pitching, All-Time By Year, AL, CG". Major League Baseball (MLB), mlb.com. Retrieved January 3, 2013. ↑ "Single-Season Leaders & Records for Games Started (Baseball-Reference, Leaders, Pitching Leaderboards, Games Started, Single-Season)". Sports Reference LLC, Baseball-Reference.com. Retrieved January 3, 2013. ↑ "Baseball-Reference.com, Single-Season Leaders & Records". Sports Reference LLC, Baseball-Reference. Retrieved January 3, 2013. ↑ "MLB Statistics, Pitching, All-Time By Year, MLB, GS". Major League Baseball (MLB), mlb.com. Retrieved January 3, 2013. ↑ "MLB Statistics, Pitching, All-Time By Year, MLB, CG". Major League Baseball (MLB), mlb.com. Retrieved January 3, 2013. 1 2 3 4 5 6 7 8 9 10 11 12 13 14 15 16 17 18 19 20 McElreavy, Wayne. "Jack Chesbro". Society for American Baseball Research. Retrieved November 25, 2011. ↑ "John Dwight Chesebrough". Retrieved December 10, 2011. 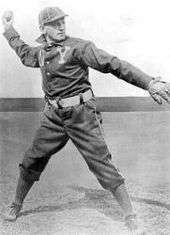 1 2 3 "Jack Chesbro, Pioneer of Spitball Hurlers and Ace on Old New York Highlanders, Dies of Heart Attack". The Evening Independent. November 7, 1931. Retrieved November 25, 2011. ↑ "One To Naught In Windy City: Orphans Succeed in Shutting Out St. Louis Nine". Deseret Evening News. August 4, 1899. p. 5. Retrieved November 25, 2011. ↑ "1899 Pittsburgh Pirates Trades and Transactions". Baseball-Reference.com. Retrieved December 20, 2011. ↑ "1901 National League Pitching Statistics". Baseball-Reference.com. Retrieved November 25, 2011. ↑ "1902 National League Pitching Statistics". Baseball-Reference.com. Retrieved November 25, 2011. ↑ "American League Here; Another Baseball Team Proposed for New York Next Season" (PDF). The New York Times. September 7, 1902. Retrieved November 25, 2011. ↑ "Happy Jack: Chesbro and his Famous Spit Ball Was Too Much For The Bostons". Youngstown Vindicator. October 8, 1904. p. 12. Retrieved November 25, 2011. ↑ "Chesbro Tells How To Throw The 'Spit Ball'". The Pittsburg Press. October 9, 1904. p. 19. Retrieved November 25, 2011. ↑ "Chesbro Has Slow Ball Which Puzzles Batters". Spokane Daily Chronicle. Pittsburg Press. July 22, 1904. p. 3. Retrieved November 25, 2011. ↑ "1904 American League Pitching Statistics". Baseball-Reference.com. Retrieved November 25, 2011. ↑ Jim Reisler, Before They Were The Bombers: The New York Yankees' Early Years, 1903–1915 (Jefferson, N.C.: McFarland & Co, 2002), p. 98. ↑ Singer, Tom (November 4, 2011). "La Russa leads pack of innovative skippers: Unconventional tactics changed and shaped the game". MLB.com. Retrieved November 25, 2011. ↑ "Daniels Led Swimmers in the Olympic Games; New York Athletic Club Lad Easily First in His Heat. Schwartz Also Qualified: Mitchel Still in Bad Shape and May Only Compete in the Discus-Throwing Event". The New York Times. April 26, 1906. Retrieved March 22, 2012. ↑ "1906 American League Pitching Statistics". Baseball-Reference.com. Retrieved November 25, 2011. ↑ "Pitchers Taken From Game. ; New York Leads All American League Clubs -- Chesbro at Top" (PDF). The New York Times. November 4, 1906. Retrieved November 25, 2011. ↑ "Chesbro Hopes To Win Back His Lost Laurels". The Pittsburgh Press. December 28, 1906. p. 16. Retrieved November 25, 2011. ↑ "Chesbro Quits Baseball" (PDF). The New York Times. February 23, 1907. Retrieved November 25, 2011. ↑ "Pitcher Chesbro in Lumber Business" (PDF). The New York Times. March 20, 1907. Retrieved November 25, 2011. ↑ "American League. ; Boston Again Defeats "Yankees" in Heavy Hitting Game, 4 to 3" (PDF). The New York Times. May 2, 1907. p. 12. Retrieved November 25, 2011. ↑ "Baseball Notes". The Pittsburgh Press. December 27, 1907. p. 16. Retrieved November 25, 2011. ↑ "Happy Jack and Dummy Taylor: Two Former Metropolitan Stars Are Relegated To Bush Leagues". The Day. February 3, 1909. p. 10. Retrieved November 25, 2011. 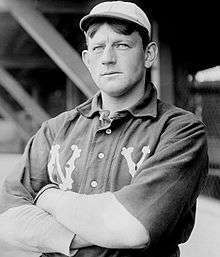 ↑ "Yankees Close Season in Boston; Jack Chesbro Tried Against Old Teammates, but Is Driven from the Box. Teams Make Even Break: New Yorks Take First, 6 to 5 -- Batting Rally Gives Locals Second Contest by Score of 6 to 1". The New York Times. October 3, 1909. p. S1. Retrieved November 25, 2011. ↑ "Whitinsville Won; Leads Mill League". Evening Tribune. July 17, 1910. p. 6. Retrieved November 25, 2011. ↑ "Woonsocket Blanked the Whitinsville Team 2 to 0: Still Retain Lead in Mill League, Chesbro Pitches Milford to Victory". Evening Tribune. June 18, 1911. Retrieved November 25, 2011. ↑ "Jack Chesbro Will Return To Highlanders". The Gazette Times. February 3, 1912. Retrieved November 25, 2011. ↑ "Jack Chesbro Reinstated". The New York Times. March 20, 1912. Retrieved November 25, 2011. ↑ "Rain Keeps Superbas Idle". The New York Times. March 14, 1912. Retrieved November 25, 2011. ↑ Newberry, Paul (August 29, 2005). "A century later, Ty Cobb still hard to figure out". The San Diego Union-Tribune. Associated Press. Retrieved December 20, 2011. ↑ "Richie Ashburn singled out as worthy of Hall of Fame". Reading Eagle. March 12, 1985. Retrieved December 20, 2011. Wikimedia Commons has media related to Jack Chesbro.